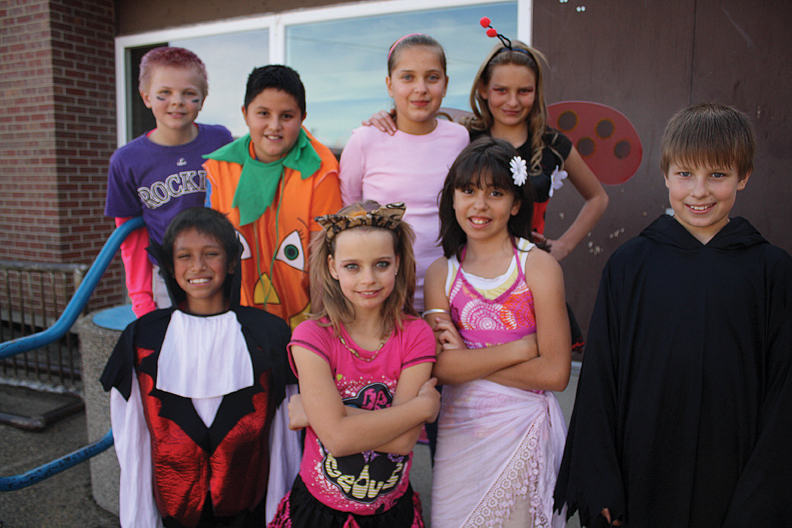 Fifth grade students at Sandrock Elementary School show off their Halloween costumes. (Front, from left) Max Perez, Elizabeth Voiland, Mandy Cazares, (Back, from left) Keaton Durbin, Christopher Harmon, David Lopez, Tauren Farquharsan and Mckenzie Guevara. When asked what her favorite costume from previous years was, Craig Middle School 8th grader Mattie Jo Duzik had no problem recalling her best outfit. “In 6th grade I was an old lady. It was awesome,” said Duzik. Students and teachers were dressed up in interesting outfits at many local schools today, ranging from traditional, spooky choices, like monsters and witches, to more out of the box options, like Buddy the Elf. Riley Allen, an 8th grade student at CMS, chose to don the green hat and fur-lined jacket of the main character of the 2003 holiday film Elf because he likes the movie and looks a lot like its star, Will Ferrell. Tane Otis created her own punk rock inspired costume with hairspray, face paint and a leather jacket. Otis said her pink, spiked mohawk was the 3rd one she had worn this year.